Learn how to make your own pizza dough. 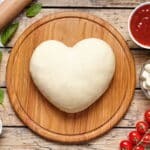 This is a simple but versatile recipe that you’ll find yourself using for all kinds of things, from garlic knots to foccaccia to, well, PIZZA! I use pizza dough quite often. I typically buy balls of fresh, uncooked dough from the bakery section of my grocery store. Then I turn that dough into garlic knots or skillet bread to have alongside meals. It’s so tasty and versatile! However, there are days when I suddenly want to make garlic knots, or, well, pizza, and I don’t have pre-made dough on hand. When that happens, I make my own. As far as bread recipes go, it’s pretty simple. There is some time involved in letting it rise, but otherwise, it’s basic bread-making. You mix together yeast, honey, olive oil and water and let it sit until foamy. Then you add flour and salt and mix until you get the right consistency (it’s holding together well and is still slightly sticky). Then you knead it. Then let it rise. I’ve given instructions in the recipe below for making this by hand, as in not using a stand mixer. If you have a stand mixer though, combine the yeast, honey, olive oil and water in the bowl of the mixer. Using the kneading paddle, add the flour until the desired texture is reached (again, holding together well and still slightly sticky). Then use the kneading paddle to knead it for 5 minutes. The rest is the same. 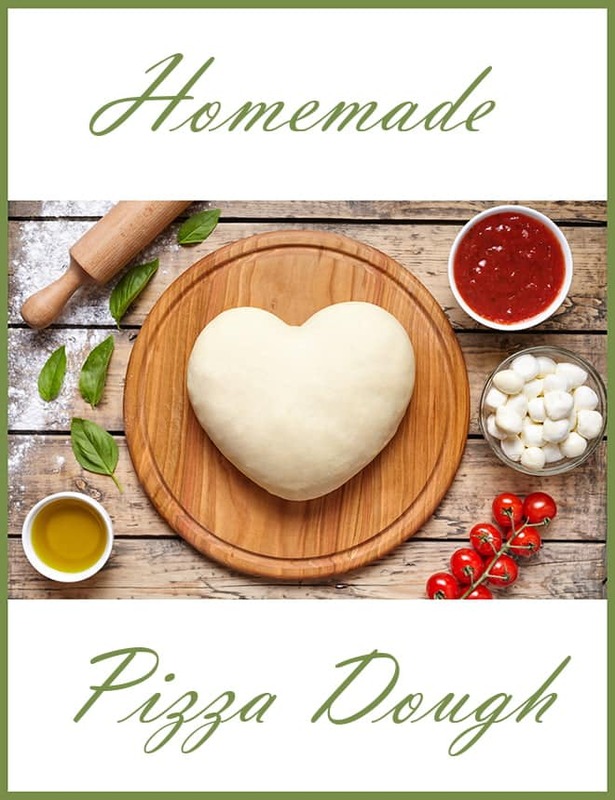 OK, here you go…a simple recipe for homemade pizza dough. Enjoy! Measure the water into a large microwave-safe bowl. Microwave it 20 seconds at a time until warm but not hot, about 110°F. Stir in the yeast, honey and 1 tablespoon of olive oil. Let sit until it gets foamy, about 5 minutes. Add half of the flour and all of the salt and stir until smooth, using floured hands if that makes it easier. Add more flour 1/4 cup at time, kneading the dough between additions. Add just enough flour so that the dough holds together well and is only a little bit sticky. You may not need all of the flour. Lightly flour the counter and transfer the dough there. Knead the dough until it’s smooth (it will still be sticky), 3-5 minutes. Measure 1 tablespoon of olive oil into a large clean mixing bowl. Add the dough and rub it around in the oil. Flip the dough over so that the oiled side is up. Cover with plastic wrap and let rise in a warm draft-free spot until it has doubled in size, about 1 hour. Punch dough down and then use as recipe directs. For pizza, bake until edge is lightly browned and middle of dough is cooked through. For a medium-thickness crust with a medium amount of toppings, that will be about 20 minutes at 400F.